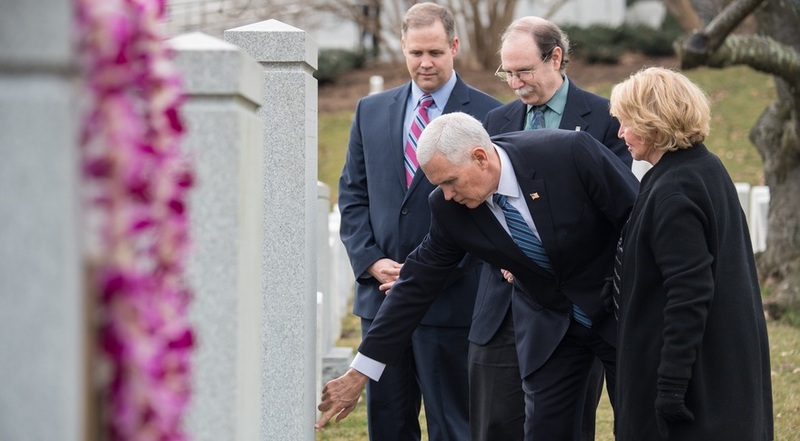 Today is the NASA Day of Remembrance, an opportunity for Americans everywhere to reflect on the service of the men and women of NASA who helped lead our nation into the heavens and never came home. We are inspired by all those who have dedicated their time and talent to exploring the universe, discovering the mysteries of creation, and pushing the boundaries of human potential. But on this occasion, we pay special tribute to the heroic sacrifice of those who have lost their lives throughout our ascent into the stars. They include some of our nation’s first pioneers in space, the crew of Apollo 1. More than 50 years after the heartbreaking accident that claimed their lives, Gus Grissom, Ed White and Roger Chaffee live on as giants in the history of space exploration. Their sacrifice laid the foundation for the first successful moon landing just two years later, and their legacy has inspired the American people ever since. We also remember those who perished aboard the Space Shuttle Challenger. The loss of those “seven star voyagers” was a reminder of both the danger that our astronauts encounter and the dauntless courage they demonstrate in its face. And we recall those lost in the most recent American spaceflight tragedy, the men and women of the Space Shuttle Columbia. Their tragic accident just minutes before landing grieved the nation, but the example of teamwork and dedication they set and the legacy they left behind united our country in shared resolve to continue their work. Each of these heroes knew the risks. Yet each of them chose to answer the call to serve, going above and beyond what was asked of them and, in the end, making that ultimate sacrifice. So while we mourn their loss, we also honor their memories by continuing the mission for which they gave the last full measure of devotion, and by working harder, building bigger, and venturing further than ever before. The men and women of NASA, and all who work in America’s space industry, have no greater ally than President Donald Trump. As he’s said, we are “reclaiming America’s heritage as the world’s greatest space-faring nation.” And from day one, we’ve taken decisive action to make good on that promise. In our first year, after laying dormant for nearly a quarter-century, the President relaunched the National Space Council to coordinate our nation’s space activities and bring the full force of our national interest to bear on space-related decisions. And it’s my great honor to serve as the Council’s Chairman. Not long afterwards, the President signed Space Policy Directive-1. This directs NASA to send American astronauts back to the moon to establish the capacity to put American boots on the face of Mars. We’ve also recognized that the red tape of today hinders the success of tomorrow, so we’re empowering America’s commercial space industry by transforming the licensing and regulatory systems that oversee launch, re-entry, and space operations. By unleashing our private partners, we will discover new opportunities, develop new technologies and achieve greater success than ever before. But we know that security is the foundation of prosperity, and as President Trump has stated clearly, space is “a war-fighting domain, just like the land, air, and sea.” So to meet the emerging threats on this new battlefield, we have begun to establish a sixth branch of our military: the United States Space Force. In space, as on Earth, we will always seek peace. But history proves that peace only comes through strength, and the Space Force will be our strength in space. Our goals for the future are only possible because of the sacrifice of those who have gone before. So 50 years after the world marveled as three brave young astronauts flew a quarter of a million miles and planted our flag on the face of the moon, we must recommit ourselves to upholding their legacy and restoring American leadership in space. And we will honor the service and sacrifice of all those who have given their lives for the sake of that cause by embracing the challenges that lie ahead and building a brighter future for all. Mike Pence is Vice President of the United States of America.